Photodynamic Therapy (PDT) is an exciting new technology for dermatologists. PDT is a combination treatment of topical medications along with a special light that together are used to treat a variety of skin diseases. A distinct advantage of Photodynamic Therapy is that the affected area can be treated and the surrounding normal skin is unaffected. WHAT CONDITIONS ARE TREATED WITH PHOTODYNAMIC THERAPY (PDT)? Dr. Rebecca Baxt and Dr. Saida Baxt advise patients that multiple lesions can be simultaneously treated at each session. PDT treatments have been shown to prevent the development of new lesions. 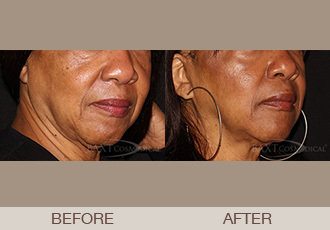 **Photodynamic Therapy is an FDA approved treatment for precancerous lesions on the face. As previously mentioned, PDT is approved by the FDA for the treatment of actinic keratosis, which is considered a precancerous lesion. When treating actinic keratosis with Levulan® and PDT or laser, the light source or laser activates the Levulan® which preferentially takes up the precancerous cells and the sebaceous glands. Dr. Rebecca Baxt and Dr. Saida Baxt typically cover the entire area of the patient’s skin rather than just the individual spots or precancerous lesions. This is done as a precaution to also remove any spots that are very small and cannot be seen with the naked eye. This preventive treatment works to keep the tiny spots from growing and becoming cancerous.